Music wellness strategies explore stress and anxiety reduction through mindfulness techniques, including deep breathing, meditation, journaling, creative arts, and active music making. Students or staff members faced with particularly stressful periods of their lives can significantly benefit from these approaches. Board-Certified music therapists may focus on using music to develop healthy coping mechanisms, explore using music for wellness and self-care, use music and art strategies for expression, prevent burnout, promote gratitude, and enhance relaxation. Whether it’s for a single afternoon of stress relief or weekly opportunities for relaxation, MusicWorx Board-Certified music therapists create a program designed to meet the needs for your students or staff members. We use wellness interventions to reduce anxiety and stress and provide an empowering environment for any student or staff member to express themselves and develop a support network. Board-Certified music therapists will work to create and implement opportunities for meet the specific needs of small groups of students and/or staff. These groups may include single classes or series of classes on specific subjects or with specific goals in mind. Designed by Board-Certified music therapists to fit the needs of your student body and/or staff as a whole, large group opportunities may take place in lecture halls, common areas, or outdoors on campus and involve active music making and self-care techniques for stress and anxiety reduction, self-expression, and socialization. 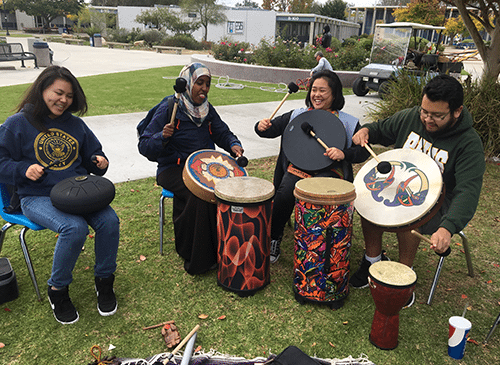 Music therapists assist colleges and universities with designing the appropriate program for their needs and assist students or staff with self-care and academic goals in order to reach their highest potential.